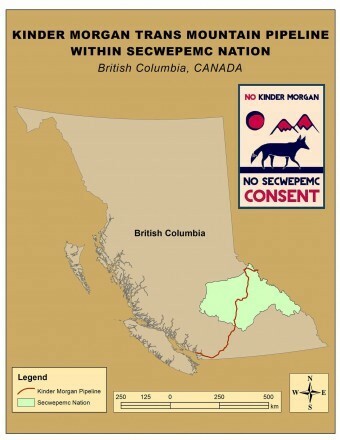 Secwepemc Territory, BC — The Indigenous Network on Economies and Trade (INET) pioneered an Indigenous risk assessment of Kinder Morgan Canada’s Trans Mountain Expansion Project (TMEP), demonstrating that failure to take into account Indigenous jurisdiction and land rights constitutes too great a risk for large projects seeking access to Indigenous lands and resources. This was confirmed by Kinder Morgan Limited (KML) Canada this weekend, when following another mobilization by Indigenous Peoples against the TMEP, KML announced that it is suspending non-essential spending on the TMEP because the risks to investors are too great. The Indigenous Network on Economies and Trade (INET) is a network of Indigenous peoples and non-Indigenous supporters who work toward promoting the economic dimension of Aboriginal and Treaty Rights. We have prepared legal arguments that Canadian policies that fail to recognize Aboriginal and Treaty rights and our decision-making regarding access to our lands and resources, constitute a subsidy under international trade law. Our submissions have been accepted by World Trade Organization (WTO) and the North American Free Trade Agreement (NAFTA) tribunals during the last round of the Canada USA Softwood Lumber Dispute. Tagged Canada, Kinder Morgan, Secwepemc, Trans Mountain Expansion Project, Trans Mountain Pipeline.